Theresa May wins confidence vote by majority of 200 to 117 and is immune from a leadership challenge for a year. 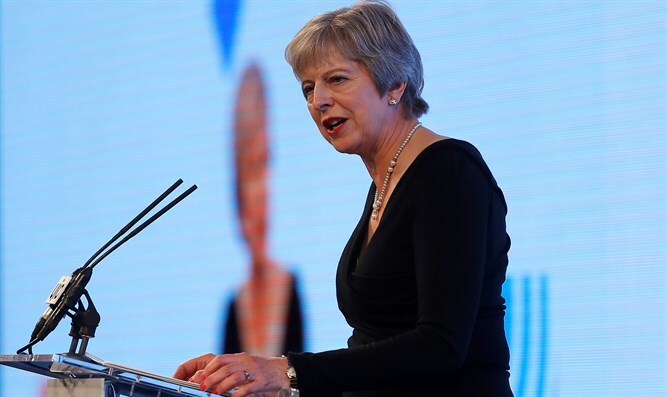 British Prime Minister Theresa May on Wednesday won a vote of confidence in her leadership of the Conservative Party by a majority of 200 to 117. May is now immune from a leadership challenge for a year. The vote was initiated at the behest of members of her own Conservative Party over her handling of the Brexit negotiations. Speaking in Downing Street after the vote, she vowed to deliver the Brexit "that people voted for." She added, however, that she had listened to the concerns of MPs who voted against her and would be fighting for changes to her Brexit deal at an EU summit on Thursday. May said she had a "renewed mission - delivering the Brexit people voted for, bringing the country back together and building a country that really works for everyone," according to the BBC. The report noted that the result was "not at all comfortable" for the prime minister and a "real blow" to her authority. Jacob Rees-Mogg, who led calls for the confidence vote, said it was a "terrible result for the prime minister" and called on her to resign. Despite winning the vote, May still faces a battle to get the Brexit deal she agreed with the EU through the UK Parliament, with all opposition parties and, clearly, dozens of her own MPs against it. May earlier vowed to fight on to deliver her Brexit deal but also promised to stand down as leader before the next scheduled election in 2022. If she had lost the confidence vote, May would have been forced to stand down as Conservative Party leader, and then as prime minister.